Over the years, Cincinnati has become a prime spot for nightlife. We have it all: great music venues, awesome clubs, some of the best comedy in the country, and bars to suit every personality. If you’re looking for a good time, Cincinnati’s got you covered. Music: Esquire magazine ranked Cincinnati as one of the country’s top 10 cities for music, and it’s not hard to see why. On any given day, you’ll find some of the best performers in the world flocking to Cincinnati to put on shows. From undiscovered indie bands to the world’s most established rock stars, music is pumping through the veins of this city. 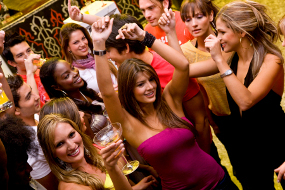 Party Bus Cincinnati will get you to the next concert in style! Clubs: Ready to get your dance on? Our nightclubs are steaming up Cincinnati! 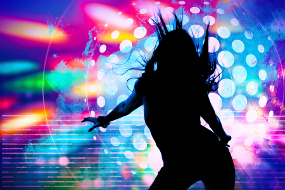 Whether you’re just out for a night on the town or celebrating a big event, you can dance the night away starting from the moment you hit the road in one of our party buses. 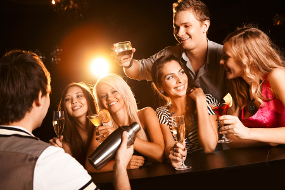 Party Bus Cincinnati will help you hop from one club to another without a thought to parking, traffic, or picking a designated driver. Comedy Clubs: Did you know that laughter has the ability to lengthen your life? So think of your next visit to a comedy club as an investment in your health! Our stages are home to some of the most hilarious performers around. If you need a pick-me-up, buy tickets to get a night of laughter in! Bars: From dives to swanky lounges, Cincinnati has it all. We suggest visiting each and every one in a bar crawl across the city. Only, rather than crawling, why not cruise? 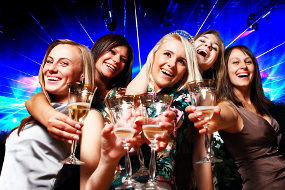 Our party buses will chauffeur you from one drinking spot to another, while keeping the party going on board. 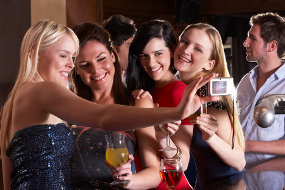 Forget pulling the short straw – Party Bus Cincinnati will be your designated driver!